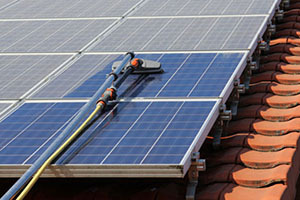 DMC's Solar Panel Cleaning Service in Milton Keynes, uses specialist cleaning equipment to safely clean solar panels without causing any damage to the surface. This is a tried and tested piece of equipment that will ensure maximum energy output from the solar panels. Our commercial solar panel cleaning consists of specialised poles and brushes that clears away any build-up of dust or dirt, allowing more light into the solar cells, allowing more energy to be generated. It is important to maintain regular solar panel cleaning, this will help keep them protected and allowing ultimate usage of your solar panels. Due to the location of the solar panels they are prone to get a build-up of dirt and particular bird droppings, which will need cleaning. DMC facilities management are fully qualified in cleaning these areas and understand how to help keep the panels protected and how to make the most of your investment. Cost efficient: We will help you save money by providing a high level cleaning. Environmental friendly: We do not require any detergents or chemicals. Safe: We stay safe by not using any ladders and using specialised equipment to ensure there is no damage to your solar panels. Flexible: We are able to work all year round and in almost any weather conditions, allowing us to find a time that is most convenient for you. Health and Safety: We comply with the latest legislation insuring we work safely and effectively. Satisfaction: We take pride in our customer satisfaction and will undergo work at a high standard. If you would like any information regarding our commercial solar panel cleaning within Milton Keynes call our specialists today on 01525 500 100 or if you have any questions regarding the maintenance of solar panels please contact us.